Providing ready-made pictures for a growing group of affluent townsmen who dominated Edo period (1600-1868) Japan, anonymous painters (machi-eshi) carried on the earlier native Japanese tradition (yamato-e) in themes such as genre, history, the seasons, and famous places. Their formal language derived from Japanese sixteenth-century painting, which was inspired in turn by both Chinese ink painting and Japanese narrative painting. The works they created were meant to please patrons and were devoid of philosophical or moralizing content. These screens belong to a canonical group of pictures of famous places (meisho-e) expressing a distinctive Japanese sensibility- an emotional response to sites renowned for their beauty, particularly when combined with the imagery of the changing seasons. 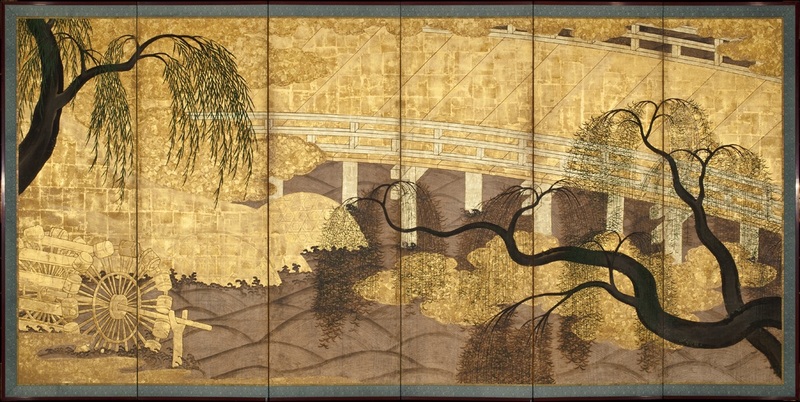 The Willows and Uji Bridge theme assumed the form seen here in the Momoyama period (1573-1615)- the great age of screen painting- when gold was used lavishly and dynamic asymmetrical composition produced the simplified close-up view. As a seasonal reference, the passage of time is implied by the changing size of the willow leaves as the viewer moves from right to left through the painting. Realism as well as decoration inspired the three-dimensional treatment of the silvered metal moon, now tarnished, and of water wheels and baskets built up in gesso. See the associated painting, Willows by the Uji Bridge.